Heading a high-profile politico-economic delegation, Iranian foreign minister Mohammad Javad Zarif started his visit to Serbia, Bulgaria, Croatia and Bosnia and Herzegovina on February 26. Zarif visited Belgrade on Monday at the first step of a four-nation tour of Eastern Europe. Visiting Serbian Prime Minister Ana Brnabić, President Aleksandar Vučić, Foreign Minister Ivica Dačić and attending a joint trade conference with 70 Iranian and Serbian companies were on Zarif’s itinerary in Belgrade. 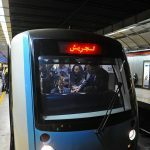 Cooperation between Tehran and Belgrade at international bodies and crises in the West Asia region as well as the need to settle disputes in different parts of the world through diplomacy featured in the talks between Zarif and Serbian officials. The Iranian foreign minister further welcomed the idea of abolishing visa regime for the two countries’ citizens stressing that if a direct flight is launched between the two countries, business ties and relations among the people of Iran and Serbia will increase dramatically. 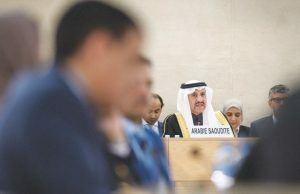 Zarif also referred to the fields of oil, gas, petrochemicals, mines, communications, agriculture and other infrastructures as suitable grounds for cooperation between the two states. Cooperation in defense, science, technology as well as cultural, artistic and academic collaborations were among other areas discussed by the two countries’ officials. Zarif also submitted a written message from President Hassan Rouhani officially inviting the Serbian president to pay a visit to Tehran. For the 2nd leg of Eastern European tour, Iranian Foreign Minister Mohammad Javad Zarif left Serbia for Bulgaria. In sofia, Zarif held talks with Bulgarian President Rumen Radev, Prime Minister Boyko Borissov, Minister of Economy Emil Karanikolov and Foreign Minister Ekaterina Zaharieva. The foreign ministers of Bulgaria and Iran discussed the state of affairs in the Middle East and bilateral economic relations on Wednesday. Ekaterina Zaharieva and Zarif said they talked about the current situation in Yemen and Syria and the importance of fighting terrorism and extremism as a common global threat. In a meeting with Bulgarian Prime Minister Boiko Borissov, Zarif also discussed ways to deepen economic relations between the two countries, and discussed the situation in the Middle East. Borissov and Zarif welcomed the fact that a Bulgarian-Iranian business forum would be held in Sofia during the Iranian foreign minister’s one-day visit. Two officials also voiced support for the Joint Comprehensive Action Plan on the Iranian Nuclear Program and underlined the need for its implementation by all parties, the Bulgarian government statement said. Meanwhile, Bulgarian President Roumen Radev told Zarif that his country is interested in deepening partnerships with Iran in trade, energy and scientific co-operation. In Zagreb, Iranian foreign minister held talks with Croatian Minister of Labor, Marko Pavić, President Kolinda Grabar-Kitarović, Speaker of the Croatian Parliament Gordan Jandroković, Prime Minister Andrej Plenković as well as his counterpart Marija Pejčinović Burić. 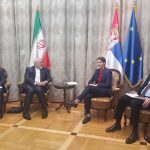 During the meeting with Croatian Minister of Labor, Zarif referred to the growing relations between Tehran and Zagreb, and called for further expansion of cooperation in energy, investment, industries, and technical trainings. They also stressed the need for facilitation of banking transactions as a means to boost economic and trade cooperation. Talking to Zarif, the Croatian president highlighted the good level of political ties between the two countries, and voiced the keen interest of Croatia’s trade sector in doing business with the Iranian side. 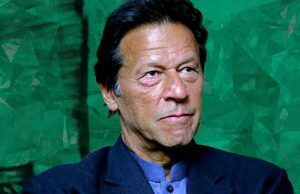 She expressed hope for the removal of obstacles to the two countries’ cooperation on investment, and called for further cooperation in tourism, food industries, science and technology and petrochemicals. For his part, Zarif noted the large economic delegation accompanying him on his third visit to Croatia in the past year, voicing readiness to boost economic relations alongside political ties. In a meeting with Jandroković, Zarif, submitted Iranian Parliament Speaker Ali Larijani’s warm greetings to his Croatian counterpart and described as satisfactory the two-way relations in the political and economic fields, especially as for people exchanges; he expressed hope the relations between the two countries would expand through removing obstacles and providing the necessary facilities. Talking to Croatian PM, Zarif noted that the two countries are currently cooperating in halal tourism, energy, agriculture, food industries, advanced technologies, and banking transactions. 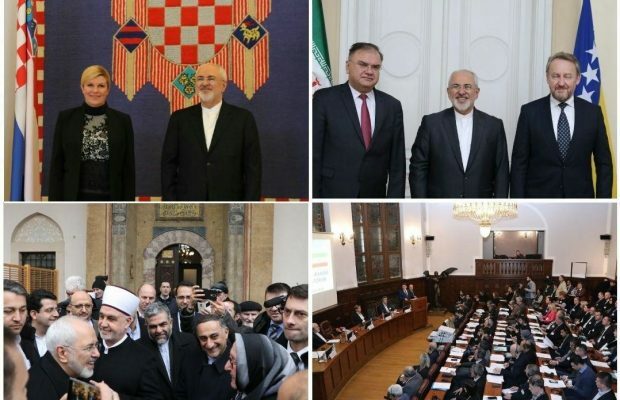 Zarif further highlighted the need to boost cooperation between Tehran and Zagreb in regional and international organizations and communities, as well as within the framework of the European Union. Speaking to Zarif, Croatian FM voiced her country’s resolve as well as the European Union’s to preserve the implementation of Iran nuclear deal. Zarif also highlighted Iran’s resolve to expand relations with Croatia in all areas free of any restrictions, and exchanged views with his Croatian counterpart on various ways to facilitate the implementation of agreements. Zarif also visited Islamic Community in Croatia on Thursday. He made a tour to different parts of the Islamic center and held talks with its head and mufti Aziz Hasanović. 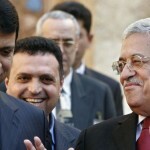 Zarif arrived in Sarajevo, the capital city of Bosnia-Herzegovina late Thursday (March. 1) on the last leg of his tour of Eastern Europe and Balkans. While in Sarajevo, Zarif held talks with Iranians living in Bosnia and Herzegovina and conferred issues of mutual interest with Baqer Ezzat Begovic head of the Bosnia and Herzegovina Presidency, Bosnian counterpart Igor Crnadak and Minister of Foreign Trade and Economic Relations Mirko Sarovic. In a meeting with Iranians living in Bosnia and Herzegovina, the Iranian foreign minister urges Muslims to repel extremism, adding extremists are not Muslim. During his stay in Sarajevo, Zarif also held meetings with Bosnia’s prime minister, foreign minister and parliament speaker. Zarif and his Bosnian counterpart Igor Crnadak in a meeting underlined the need to broaden mutual cooperation in different fields, including campaign against terrorist groups. The top Iranian diplomat’s tour of the Balkans concluded on Saturday with a floral tribute before the grave of Izetbegovic, a Muslim lawyer and politician that became the first President of newly-born Bosnia in 1992. 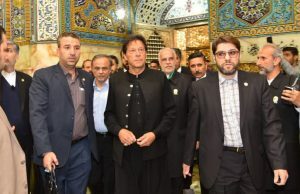 Following a 5-day tour to Eastern Europe and Balkans, Iranian foreign minister Mohammad Javad Zarif arrived in Tehran on Saturday and described his visit to 4 European countries as successful. Foreign Minister Mohammad Javad Zarif twitted late on Friday, “After successful visits to Belgrade, Sofia and Zagreb, in Sarajevo today and pleased to be able to commit to strengthening our deep ties with all Bosnians. Thanking BiH leaders for affirming that the people of Bosnia and Herzegovina will never forget Iran’s long standing support”.